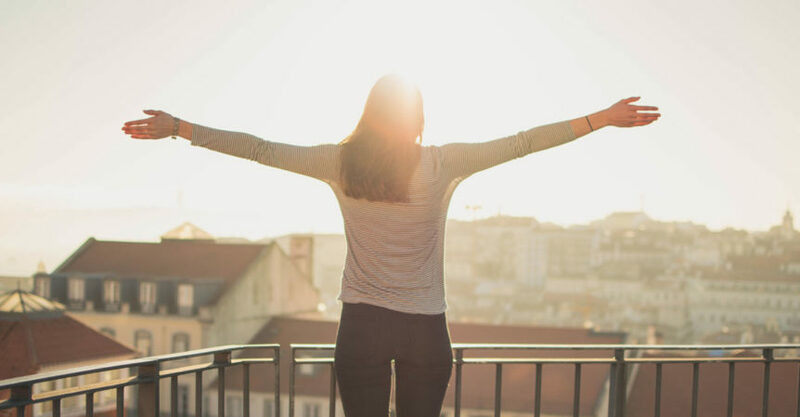 On our website, you can read numerous success stories of our students who have managed to overcome major life and language challenges to achieve their TOEFL goals. 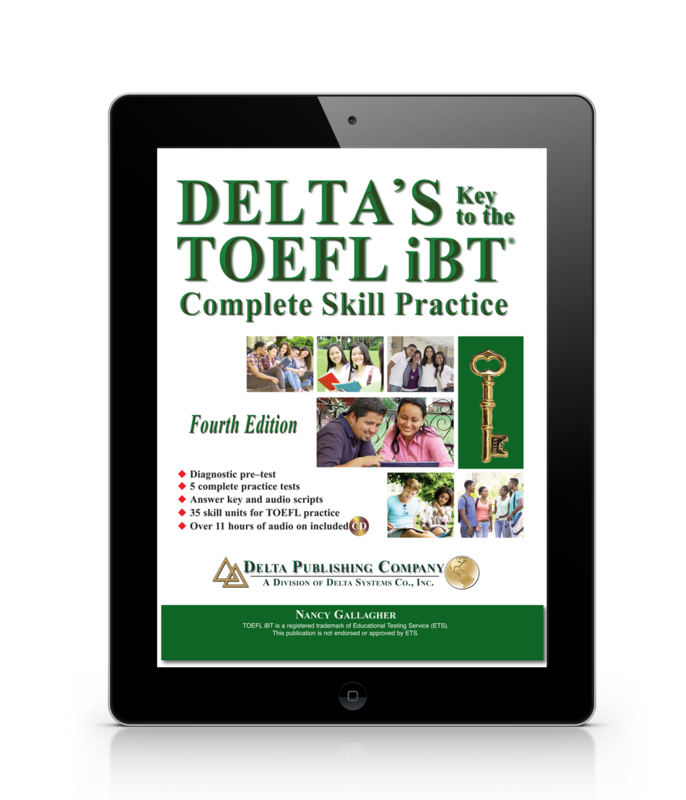 For most of them, taking the TOEFL isn’t an easy thing to do. It wasn’t an easy task for Christina, as she was facing a lot of work and social challenges on her way to a speaking score of 26. You can listen to her interview here or, if you prefer to read, you can find the complete transcript below. We hope that Christina’s story will inspire you to believe in yourself even when others don’t and things look tough. -Hi everybody, this is Jaime Miller. I want to share a situation that has happened with one of my students. Christina has been studying with me for the last few months and recently she got some really exciting news about her TOEFL iBT speaking score. I know (because we’ve worked for quite a few months together) that Christina had a lot of challenges that she was facing with work and some social issues that impacted how she was using English. And because she did such an amazing job overcoming that, I really wanted to share some of the background story about what she went through. I think that this can be very-very relevant and important for what you’re going through. -Good morning, my name is Christina, and I’m originally from Africa where I went to pharmacy school. When I graduated from pharmacy school, I was very young and I wanted to travel, so I moved to the US. When I came here… I knew at that time that I wanted to study a new language. So, when I came here, I started going to school for ESL. And I didn’t know about the foreign pharmacy graduation examination, until a friend of a friend told me about it. So I decided to give it a try, but when I finished with ESL school, a booked the TOEFL and I took it. I didn’t study, I just wanted to know my current level at that time, and then I got a 20 at Speaking. And after, I got a job as a pharmacy technician because I wanted to improve my speaking and I wanted to interact with people. So, I got a job and then I started working as a pharmacy technician, and at the same time I was studying for the FPGEE. And when I passed the exam, I knew that it was time for me to take TOEFL again but I wasn’t feeling ready so I got a tutor. We were studying but still I wasn’t feeling comfortable or ready to take the exam. And then somehow I found out about Jaime on the internet. -And I remember that you originally had a Score Analysis with me, I think. And that was at that point that I was suggesting to go and focus on really strengthening your reading and your listening. And you know, it’s interesting. I want to talk about that a little bit because that’s something that I almost always recommend everybody – is that they really need to have that strong foundation in reading and listening. Did anything change for you on the speaking and the writing section when you had that stronger foundation in reading and listening? Like did the speaking section feel easier in any way? -Yes, you know when we finished the Score Analysis, and then you told me to study for the reading and then the listening sections in order to focus on the speaking only when I’m done… I mean when I feel comfortable with the reading and the listening. I did but the thing is, like I said, I was working in a pharmacy where it was really crazy for me. So, it was really hard for me to focus on my studies and everything. I needed to transition. So, I had to quit that job, find a new one where… I mean, it’s hard to be a pharmacy technician but at the new job, it was less demanding so I had enough time to keep focusing on my studies. When I studied, I finished with the reading and then the listening section, I was sort of comfortable and I thought “Oh, I can do that with speaking if I was able to do it with reading and listening, then my speaking should be very good!” I think that’s how it impacted me. Another thing that I remember is that when it was time to begin with the speaking and you came for lessons with me, our schedules were not originally compatible. Did you change your work schedule to fir in mine? -That’s crazy stuff. When I decided to have lessons with Jaime, I was working during the day, and Jaime was in England, so it was hard to have a time when we can have lessons. And then I knew that it was so important for me. I went to school for a lot of years to become a pharmacist. And I was very tired and one with my pharmacy technician job, so I was like “I need to do something.” I had to change my work schedule. I sent an email to my boss and I went to discuss with her how it was important to take TOEFL and then pass in order to move on with my internship and everything. So it’s like… I need something from you but I’m also giving you the choice to reduction my work schedule or maybe you may see me leaving the pharmacy and find another job elsewhere. -I was scared! Seriously, going to your boss and speak this kind of style… I was very scared. But at the same time I was like – I have to do this at once. And then I went and she was like.., you know, said that I am a very good worker and everything, and she really likes the way I work, and she doesn’t want to see me leaving. And she told me that she was going to think about this and she’ll come back to me. -How many days or weeks later did it take to change that? -I love it. I think it’s great because this is one of those invisible challenges – you had to consciously make a big effort to make that a reality. If you hadn’t done that, you wouldn’t have time to do the things that you needed to do. So, let’s talk really briefly what you regular study schedule was like after you changed your work situation. We were taking lessons I think on Monday and Tuesday, so that was 2 hours there. And then what was your own homework schedule like? -I was studying every single day, no matter Friday, 2 hours in the morning before going to work. On the days we were having the lessons, I was studying only an hour or maybe 30 minutes after we finished our lessons. Sometimes I would go through what we studied and then the homework and everything, you know in order to have a mindset before going to work. And I had a plan for what I’m going to do the next day. Everyday, Monday to Friday, I was studying for 2 hours. During the weekends, I had enough time because I wasn’t working and I had time to do reading and then listening. I didn’t have to spend too much time on writing, so I would spend time doing free practice tests on random websites. During the weekend, I think I was studying for maybe 3 hours. 4 hours was too much for me because at some point doing speaking practice tests, you feel tired, you’re so tired. So, the maximum that I could do during the weekend was 3 hours on Saturday and then 3 hours on Sunday, and then spend all the time studying for reading and listening. -That’s amazing, that’s a lot. And I think part of the reason why it’s so important to focus on that is because… you guys cannot see Christina but she’s not reading from a piece of paper. This is all just coming out of her head. 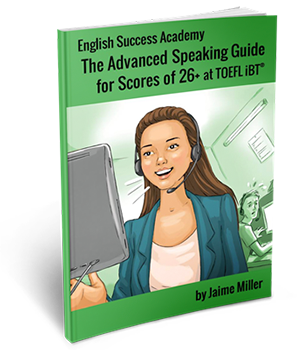 So, you’ve got a really high level of fluency, you’re able to just say what you want to say, and that’s one of the characteristics of someone who gets a speaking score of 26 or higher. The thing that we focused on mostly was perfecting your organization, perfecting your topic development on each of the responses, each of the tasks, which… because of your level of grammar and vocabulary, we didn’t have to do anything with that. I do teach grammar to some students, I do teach vocabulary. We didn’t have to focus on that with you — that was already there. So, we did some strategy work but the main focus of what we did was about neutralizing your accent mostly, just making it a little bit softer, a little bit more American. And so when you’re saying that you were spending 2 hours a day before you went to work, before you went into an all English speaking environment, you were really reviewing the things that you needed to help integrate that accent and those more neutral sounds of English into what you were using when you talked with people. So, I think it’s great. I’m not surprised that it took that much and I think that often people who need to do the same thing don’t really realize what kind of time commitment is necessary because when you’re doing accent neutralization, there’s a lot of muscle memory that you have to establish. It’s repetitive, you know. -Yes, and it may be boring but it’s totally worth it. -I remember that when we started lessons, I’m sorry, you looked so grumpy, I would try to make you smile, I was like “Come on Christina, little smile, just a little smile!” You were like, “No, I’m not gonna smile.” I was like, “Not even a little one?” You were like, “No.” It was funny because I remember that at the end, in our last lesson right before you went to the exam when you got the 26, you were completely different. You were joking, and relaxed, and human, happy again. That grumpy lady was gone. So, it’s interesting also because that kind of emotional or psychological change of just not being upset, not being angry, not being crusty anymore about the exam, and reaching that new place is also really important. And I think it’s a good indication for people as well – if they feel different, they probably are different at that point. -It’s fascinating. So, when you went to work, what was it like when you tried to use those new accent things that I was teaching you? -Today I can laugh about it but seriously it wasn’t funny. Every time I started to practice the things you told me, my coworkers would start laughing at me. I don’t know what was funny at that time but they did. So, it was embarrassing for me to try to practice something new in order to achieve a goal and then people will be laughing at me. So, I think that I came back and I told you what was going on with my coworkers. -Oh yeah, it made me so mad. I was like, “What? !” I was so mad. How dare they? -You said something that gave me more energy. You told me “I’m not going to teach you anything that would make you embarrassing in front of people.” So I said “Ok, you are my tutor, you know what you are doing.” I’m not going to let those people just have fun of me or laughing at me all the time, so I just decided to ignore everything they were doing and get practicing over, and over, and over, because I knew I had a goal and then I had to achieve that goal. It wasn’t easy at the beginning but I tried, I did my best. -I think it’s incredible. It is another one of those invisible challenges – the way that people react to you. I know that when I lived in Turkey and I was speaking Turkish, I got lots of laughs too. And it’s like, what’s funny guys? And it’s just because it’s adorable for whatever reason or people are stupid, you know there’s all kinds of reasons why they can laugh. But I know from personal experience how damaging that can be because it really messes up your confidence when you have people doing that. And yet, you had to be so stubborn to push pass that. -I may have given you some words to tell them, I think I had a lot of not very polite things to say about that. It’s important though. I think one thing that I told you was that you’re getting out of there, you, Christina, you’re gonna leave that place, you deserved so much better than being in a situation when people don’t respect you, they are not treating you well. You’re moving on! So, was there anything that was different about the way that I was tutoring you or guiding you compared to other situations you had with studying? -Yes, first of all, I think what was very helpful for me and important for me was the fact that you trusted in me. Like you said, when I started I was really upset with TOEFL and everything, and you kept telling me “I know you can do this, I know you’re brilliant, I know you’re smart.” And those words… At that time, they were just words, I was just yelling, but at some point I was like, “If Jaime said that I can do this, I’m smart, I’m brilliant and all that, that means that I can because she’s my tutor and knows what she’s doing.” So, I started changing my mindset and thinking that “Oh this is easy, this is TOEFL, I can do this.” I cannot say that I have an advanced level in English but I think I have that level that I can go to the test and I can get the 26, and get over TOEFL. 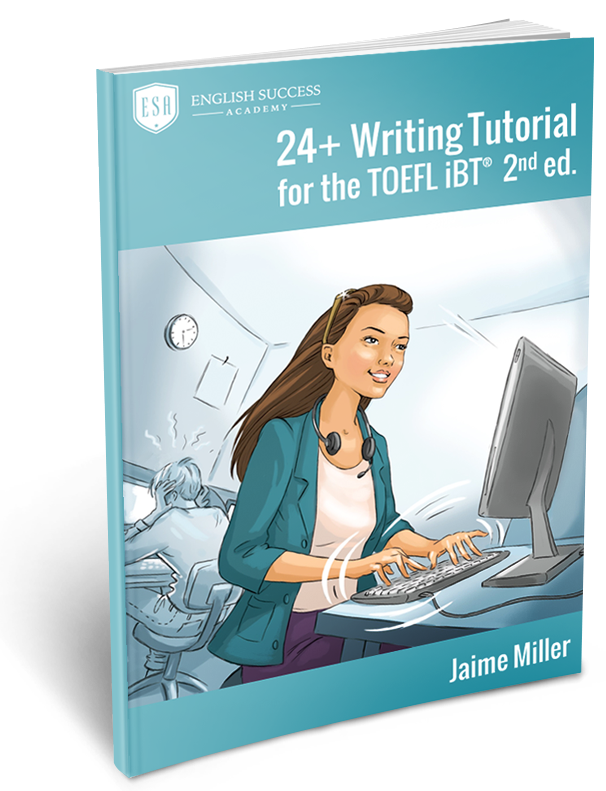 So, it’s the first thing that was really important – giving your energy and the way you help your students to be optimistic about TOEFL and not be upset about it. The other thing is you really take time to listen to the practice test. I remember one time I sent you like 10 or something, and they were like, “Girl!” But still you heard everything, and then you always come back with advice, and then you kept pushing me and pushing me. I like the word “polishing” – like “I’m just polishing your English.” When you’re studying with Jaime, don’t think that you’re going to send Jaime a practice test and she will not come back with feedback. She will always come back with something, which means that she is polishing your work. But it’s fine because you don’t want to go to TOEFL and then come back and be mad on yourself because you didn’t get your 26, or maybe over than 26. And I think the last thing is the fact that when you’re giving your lessons, you’re not distracted by anything. I’ve seen studying tutors who make you fell like they don’t care or they are so busy to stay at that moment and listen to what you’re saying. And always at the end you ask questions like, “Do you have any questions? DO you think we covered everything for today?” And all that stuff makes me feel that you’re really present at that moment when we’re having the lessons. And after the lessons, you know what you’re doing with every single student, which is amazing because our family members, friends and coworkers, they can’t understand what TOEFL is. And we need someone who can really understand TOEFL and who can really have us feel stronger, optimistic, and even feel like TOEFL is not a big thing, you know, but you have all the resources to go the test and then overcome the test. Those are the stuff that I really like when we’re having lessons and I really appreciate it, and I really want to thank you for all of that because you’re an amazing teacher. I know people who listen to that are like “ah, she went to TOEFL and then she passed, and then she’s making it sound that it’s easy.” It’s not. I’m not going to tell you that TOEFL is easy — it’s not. You have to work very hard, like put all of your energy into TOEFL, study every single day, you need to be studying every day. 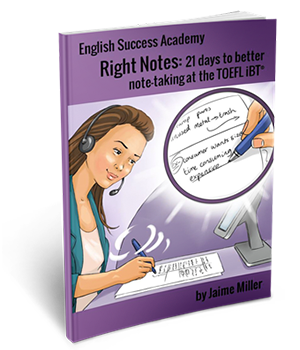 If you pass a day without studying for TOEFL, especially speaking section, then the next day you might feel like “Oh, I’m not at that level anymore.” So, it’s something that you need to study every single day. And it’s very hard but if you’re studying with Jaime, stick to every single thing she’ll tell you. Even if she’s polishing your work. -Thank you, I definitely appreciate that. I feel like it’s so exciting for you that you’re done now, it’s like a huge step forward that you’re able to move pass this. Huge congratulations! Seriously, you deserved that, you worked so hard for that, so hard! So, you needed to get a 26 on the speaking section but I remember at one point you were actually asking me, as I was polishing your work, how to get a 28. You raised you standards for yourself. -One of the things that I also remember about your test experience was that after you went on that Saturday, you came back and you sent me that message and you said something like it had gone really badly. And the other thing that I want to focus on here is that people really don’t… Well, some people accidentally score a 26 but most people who get a 26 or higher are not getting it by accident, they are getting it by design, very consciously. So the fact that you have a bad testing experience, and you still managed to get a 26 speaks to just how prepared you are for it. What happened at the exam? What were the problems? -It started with my microphone – it wasn’t working. And then I accidentally started the test, I don’t know how it happened, and they were not able to stop it. They had to move me from computers to computers, and then the time was just running. So, I fazed out and when it was a moment to start the test, I was so nervous and anxious that I felt that the reading and then the listening sections were so bad. But if I have to compare what happened to me then to the second time that I went to TOEFL, it was almost the same thing. I mean I didn’t have anything with technical issues but I felt at that moment that my performance for reading and listening wasn’t good. And when I went on for the speaking section, it’s really affected me and then I got a 20. But at this time, I was so anxious, I didn’t know that I could get a 26 but I did. It’s just to let you guys know that if you’re really prepared for TOEFL, I mean things can happen… You can go to TOEFL, and then have technical issues and all that. But keep in mind that you’re prepared for something and you can do that. I wish at that moment I could tell myself “You know girl you’re prepared, you can do this” and then get more than 26. But still I did it. When I got the results, I was like, “Wow!” I couldn’t believe it. -Yes but that’s why. Things are going to go wrong, it’s not gonna be a good testing experience. Just imagine that there will be at least one problem because you described two. And you still recovered from that. Obviously, there are not supposed to be problems during the test but there are so many opportunities for technical issues, something is gonna happen. So, if you want to get that score, you really have to be over-prepared because the safest thing to expect is that something will go wrong. We don’t know what and we don’t know where but probably there’s going to be an issue. So, I think it’s awesome and again it just shows how well you handled it. You were really strong under pressure. You did feel that freaking out and then you came back from that, and you managed to re-focus. And that’s really the beautiful lesson in there for other people is that you can feel horrible one moment, it’s ok, fine, freak out but then come back from it. Find that place of being focused again, find that place to get into your rhythm, and your routine, and the way that you were doing 2 hours of practice every day, get back into that zone. It’s awesome, you’re super inspiring, I love it. -If I have to add something, I would say that studying for TOEFL you can tell yourself that you’re studying in order to speak and be fluent in English even in emergency situations. For instance, if you are in emergency situation and then you’re anxious, and nervous, and everything, you still want people to understand what you’re saying. That was the case for me because I was literally shaking, because I was like, “Oh my goodness, I put so much energy, hard work and everything in this test, I studied over, and over, and over for months only to find myself in a situation that I may not be able to get that 26 and finish with TOEFL.” But still I did it. And I am more confident with English because whatever situation I find myself into, I will be able to speak English fluently and make myself – yes! – understood by people, you know. -It’s so good, I love it, and I love that there’s a connection between that evil exam and the real world. But I think that it’s a really legitimate thing though because people have emergencies all the time, something could happen at any point, if, god forbid, your house catches on fire or you’re in an accident, there’s all kinds of situations when you don’t have time to take notes, there’s no preparation, nobody has an opportunity to ask you to repeat yourself or to say it again, you just have to do it right the first time. As challenging as TOEFL is, there’s a value in that standard, actually, of seeing it as a target. If you’re going to be living in America, doing responsible things, and taking care of people, and having that independence, you also have the ability to take care of yourself in that language. That’s so important. And I do think that the exam actually helps you cultivate that level of confidence and accuracy. Anyway, beautiful, beautiful, thank you so much Christina for sharing it. So, I’m guessing that you’re not studying anymore, you probably sleep a lot more than you used to. -Of course! I used to wake up early in the morning, study and then go to work. Now my routine is sleep, wake up feeling energized and be like, “Ok, I’m ready to go to some work.” And this is time for me to move on with my internship. -Good luck with everything! It’s so exciting. Thank you so much! -You know I read something on your website, I think it said that a year after, you would be glad that you started. It’s really true, it is.